Every maker has a story. Be a part of Simon Metz Woodworking's story by placing an order, leaving a review, and seeing your review appear here. 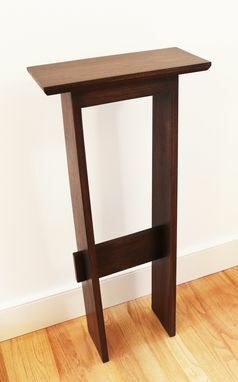 Asian inspired hall or entry table. Build in solid hardwood with through tenons. The piece illustrated is 16" wide by 8" deep by 36" high, but the size and species can be customized to your home and needs. The table is finished with 6 coats of hand rubbed oil and final coat of high quality paste wax and can be built in Walnut (pictured) Cherry, Walnut, Maple, or Oak.